Everybody expects to receive a reward certificate for being brave or performing any courageous act!! So, do not forget to reward anyone for their courageous success. 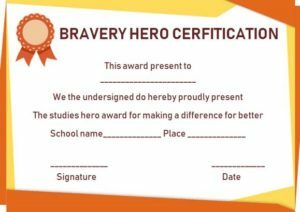 Find out our lovely Bravery Certificates Templates to reward anybody showing bravery. 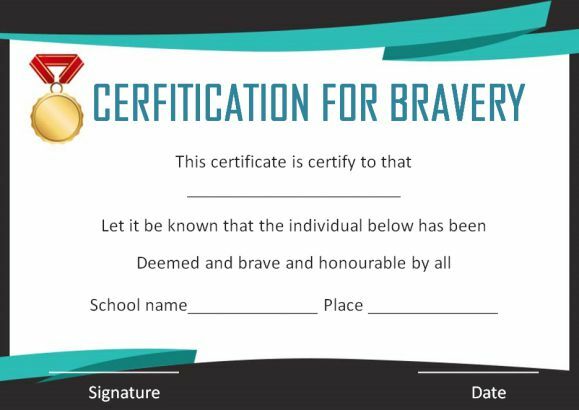 Please continue reading to know more about our Bravery Certificate Templates. Hello, everyone! I am back again with a topic that will surely entice you. 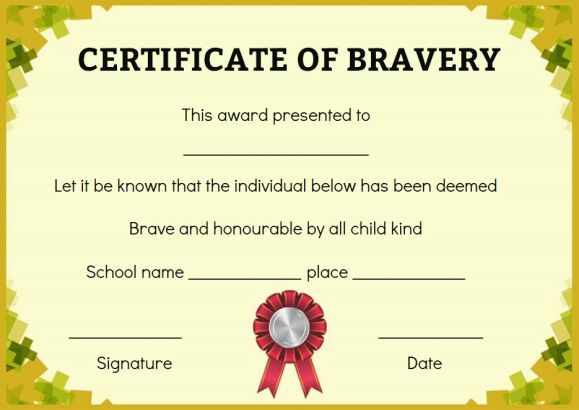 The topic is printable bravery certificates. Surely, you may have listened to stories of people who have committed a bravery act in the face of an adversity and have saved others. Yes, the first picture that comes to the mind is of army officials but sometimes, even the most unassuming person also act with an extraordinary courage and that catches the attention of all. 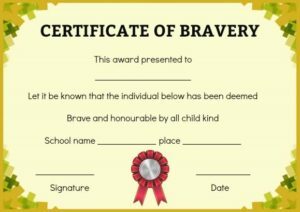 Such people regardless of their profession, age, race, gender deserve recognition and of course a certificate-a bravery certificate. So what is actually bravery? We all desire to be brave. However, fear restricts us from taking any appropriate action. Bravery is a state of mind. It is all about mental toughness that helps you to overcome obstacles with confidence and face any difficult or uncomfortable situation without wasting any time. One should be brave as this enables him or her to take actions without any apprehension. For example, firefighters and army men are brave. For example, when you are saying ‘NO’ to someone in spite of fully understanding the consequences and firmly believing that you are doing the right thing. When you are traveling to uncharted territories, it is an act of bravery. You know that there could be unexpected problems and still, you are ready to face the challenge. In short, we all can be brace if we are determined to shun our fear. 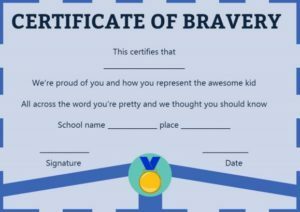 You may be wondering how to award someone you know with a bravery certificate as you have no idea about the text or the kind of design it uses to have. 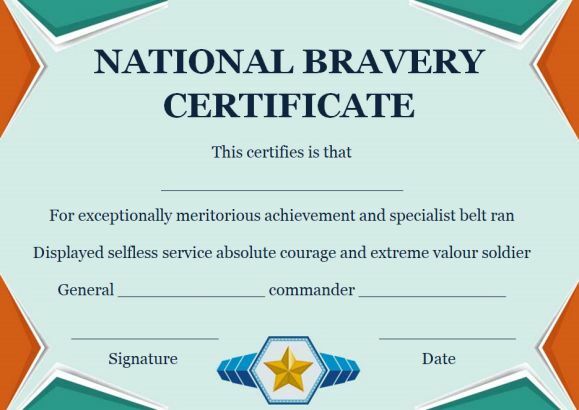 No, there is absolutely no need to worry as I will show you how to create an eye-catching bravery certificate template from scratch by using your existing computer skills. 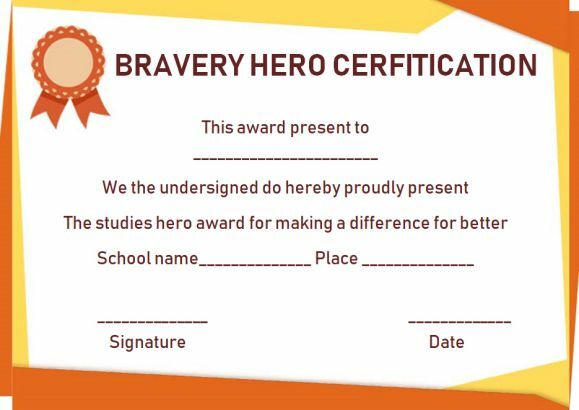 Still, if you feel that it will be a time-consuming process, you can make the use of my bravery certificate templates! 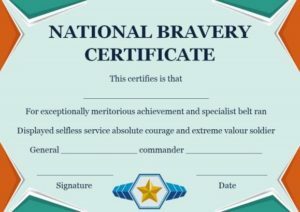 What are the wordings of a bravery certificate? 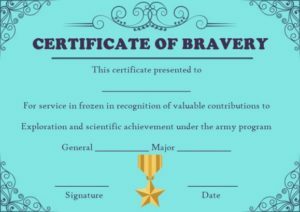 There is no rocket science with a bravery certificate wording. 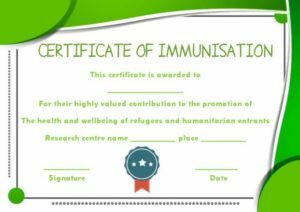 It is simple and straightforward, but I know that you need some guidance regarding the same to have a clear picture of the kind of words that you should put in the certificate. If you are going to design bravery certificate for a kid for his or her bravery attempt, you could just include the following text as headers in a sequential manner with “bravery award certificate” as a header in large font size and bold. 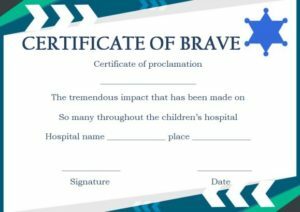 If the reason of designing a child bravery certificate is to recognize the immense courage of a kid who has undergone a complicated surgery, there could be more detailing of wordings like the inclusion of the name of the hospital, procedure, the name of the surgeon, and more. 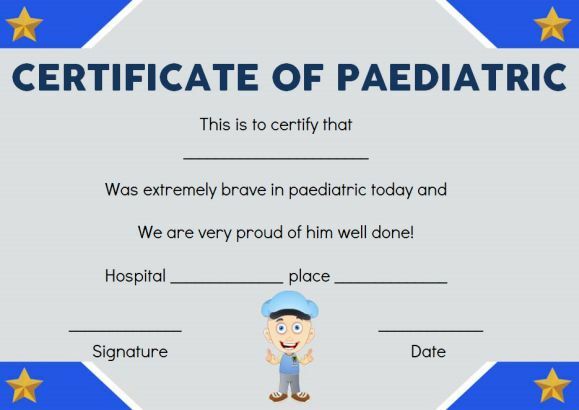 Such certificates are also known as hospital bravery certificates. 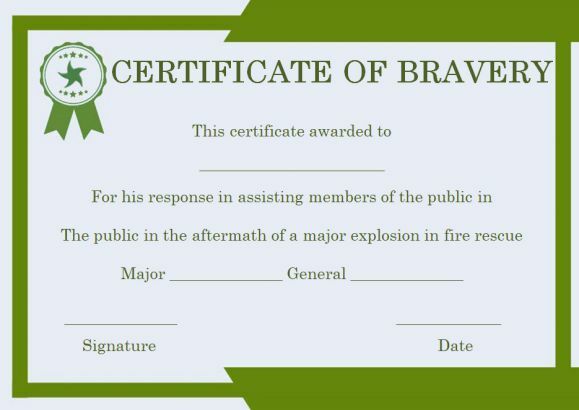 However, when the bravery certificate is for adults or teenagers, it is never the same. 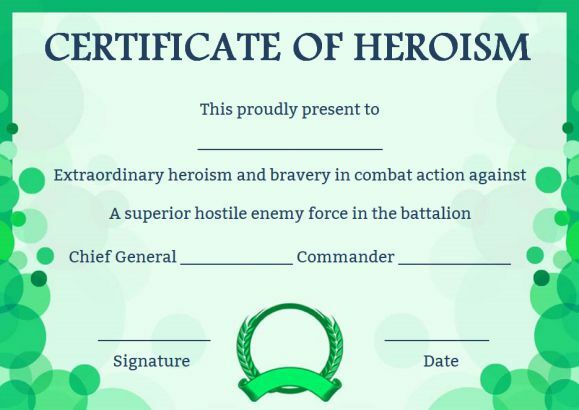 However, I am not going to explain the wordings for those bravery certificates as such certificates are then mostly awarded by either the Federal Government or community leaders for an exceptional act of bravery or a supreme sacrifice for the sake of fellow countrymen. Now, let’ us move to other types of bravery certificates which are now more in demand. 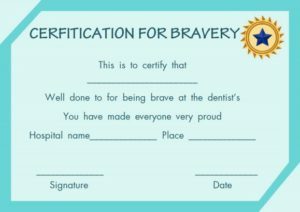 Many parents just love the idea of presenting a personalized bravery certificate to their kids when they visit a dentist. After all, most kids are scared of dentists, and parents struggle a lot to convince them. In such a scenario, dentist bravery certificate proves handy. 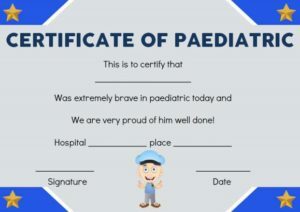 Today, many dentists also present such certificates to kids so that they feel special and don’t feel fear for regular dental checkups which is essential for ensuring a good oral hygiene. When a kid is required to admit to a hospital to undergo a surgery or for some illness for a prolonged time, parents find it tough to cope with the harsh reality. Kids too struggle to understand the situation, but at the end of the day, they co-operate after understanding they need treatment which can be possible only in a hospital setting. 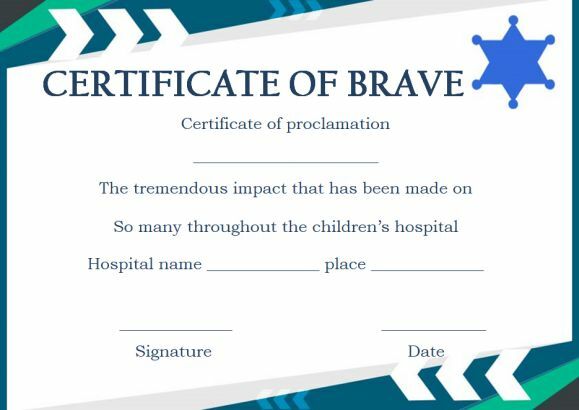 When they are discharged from the hospital authorities, sometimes parents just marvel at their courage and award them hospital bravery certificate as a memorabilia that they could proudly show to their friends and relatives. How to design a bravery certificate? Now that you have a solid understanding of the wordings and the various types of popular bravery certificates, you should know about the design aspect. 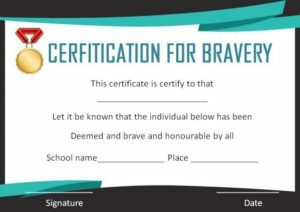 Yes, you can always have a look at my blank bravery certificate templates that you can download for free, but I will still suggest you to have a brief understanding about the kind of images or borders that you can include in such a certificate. 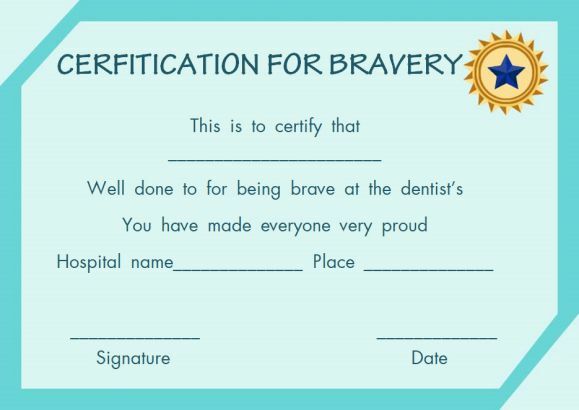 While in the case of dentist bravery certificate, it looks nice to include an image of a happy tooth or a toothbrush with loads of colors in the background as well in terms of text, in hospital bravery certificate, it is best to include a colorful image of a hospital bed or a hospital building or a doctor. 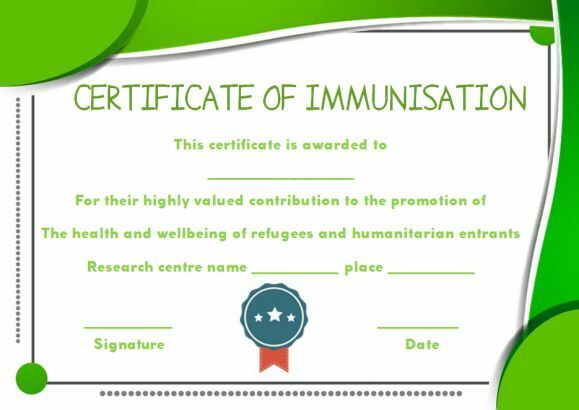 The key is to remain creative while designing such certificates.